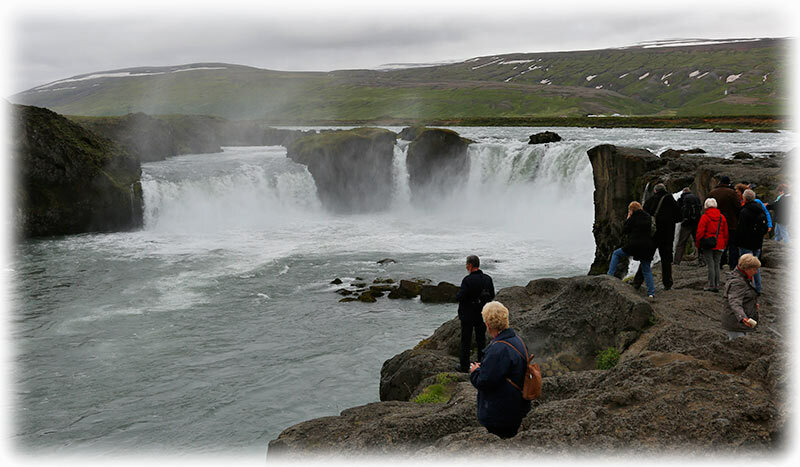 We explore Goðafoss, the waterfall of the Gods, and continue to lake Mývatn, known for its rich bird life and extraordinary volcanic lava landscapes. 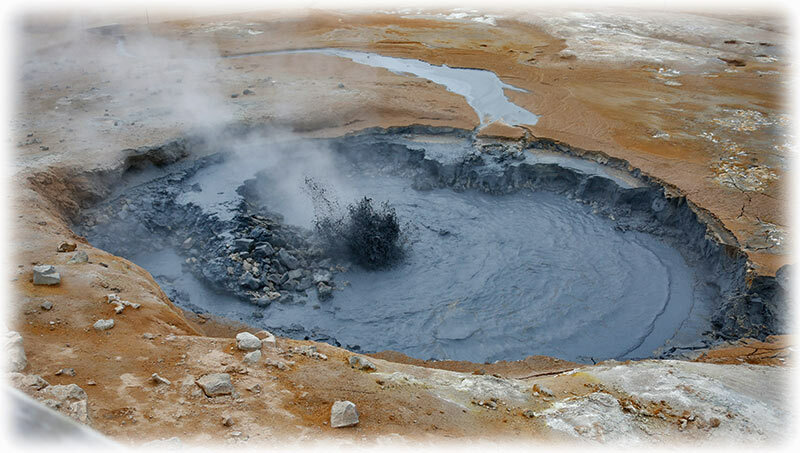 We visit pseudo craters, walk in the lava field Dimmuborgir, climb up to the rim of the ash crater Hverfjall, see the hot springs and bubbling mud pools of Námaskarð, and travel to the crater lake Víti in the Krafla geothermal fields. 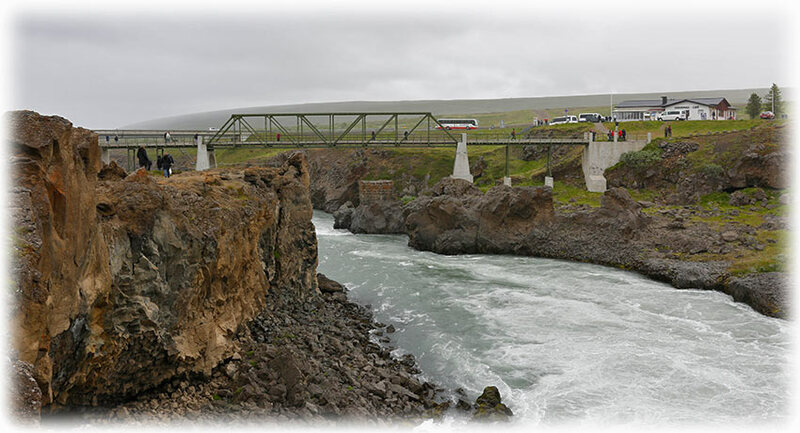 Route 1 or the Ring Road (Icelandic: Þjóðvegur 1 or Hringvegur) is a national road in Iceland that runs around the island and connects most of the inhabited parts of the country. The total length of the road is 1,332 kilometres (828 mi). 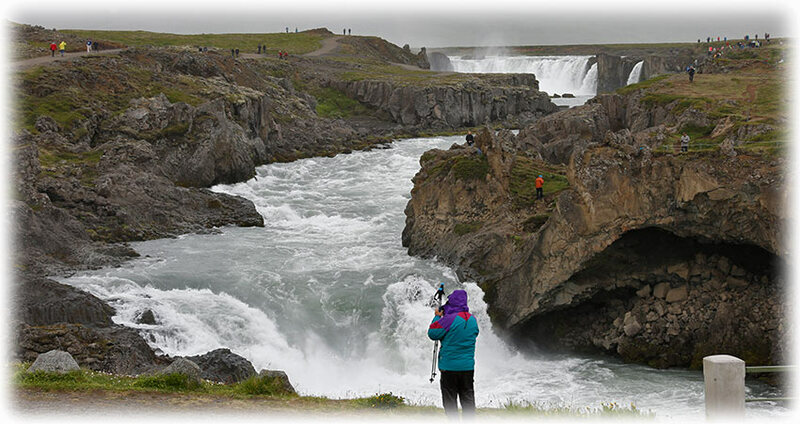 Some of the most popular tourist attractions in Iceland, such as the waterfalls Seljalandsfoss and Skógafoss, and Jökulsárlón glacier lagoon, are also on or near the Ring Road. left Kea hotel behind and we will continue on Road #1, or Route 1. 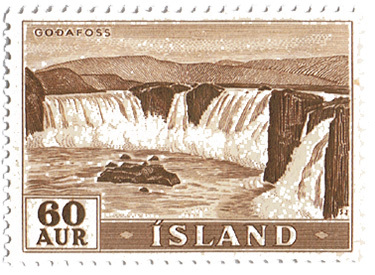 First stop will be at the Goðafoss, the waterfall of the Gods. Well, maybe we do a few photo stops on the way. 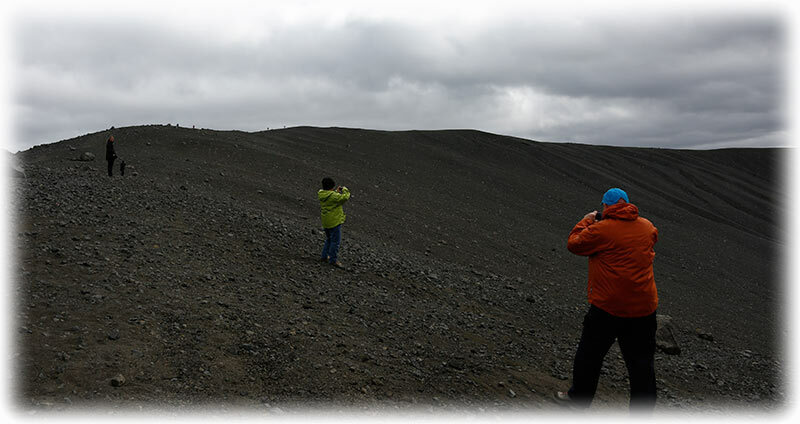 First photo stop was on the East side of Eyjafjörður. 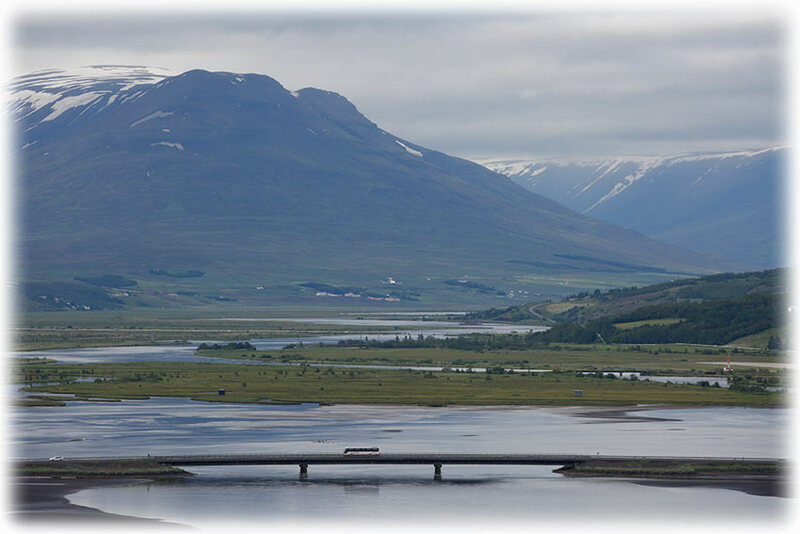 There is a viewing place with a view over the Akureyri. 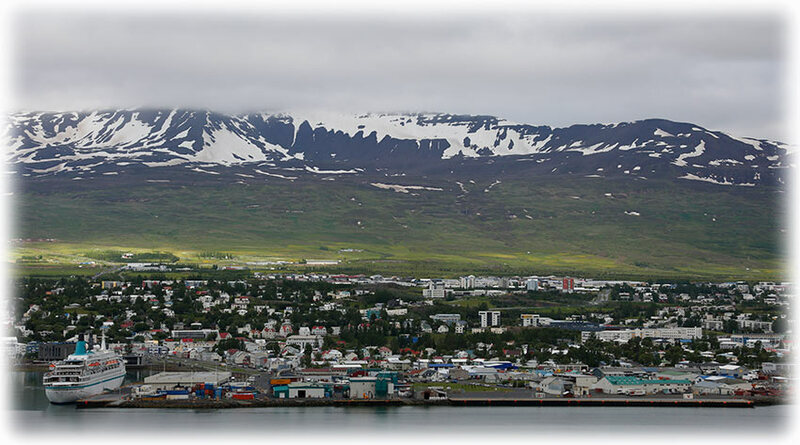 We stopped to have a few pictures of Akureyri and we were on our way again after a few minutes. 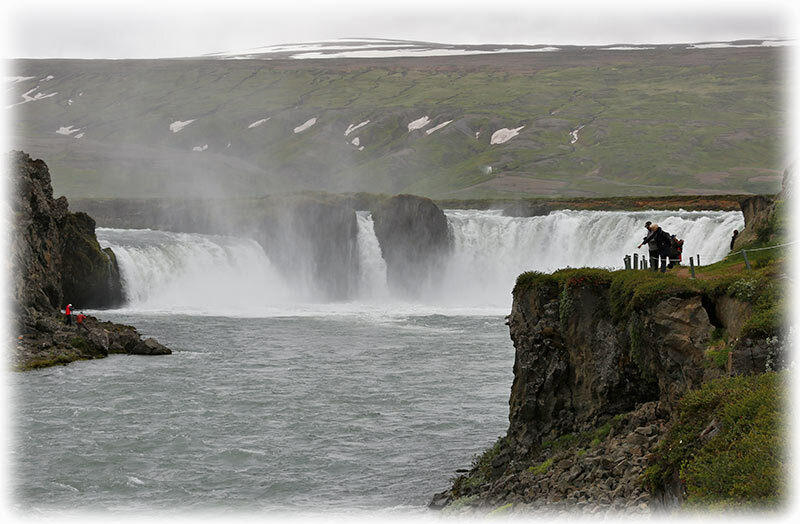 We were soon reaching the Goðafoss, the waterfall of the Gods. We got off the mini bus/ van and we would walk down the river to a service stop where our driver would wait with the car. 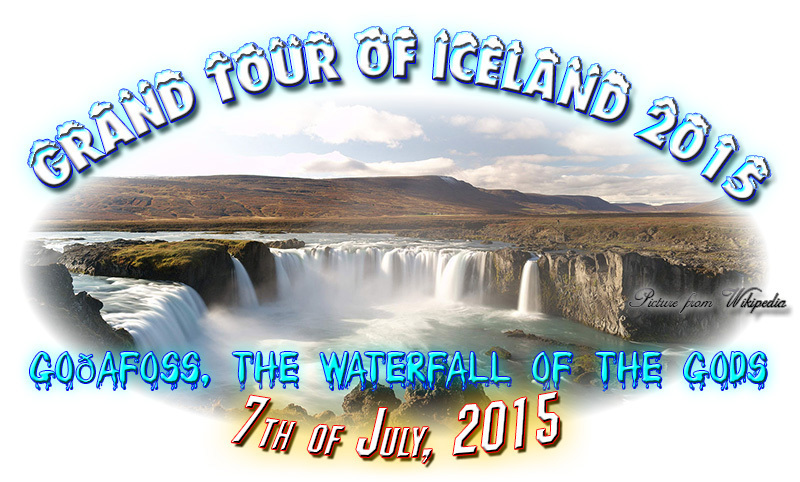 I'm sure, well, I'm sure this is a nice place to visit. When the weather is good. It was a beautiful place but I was cold and my cold was now a sore throat. 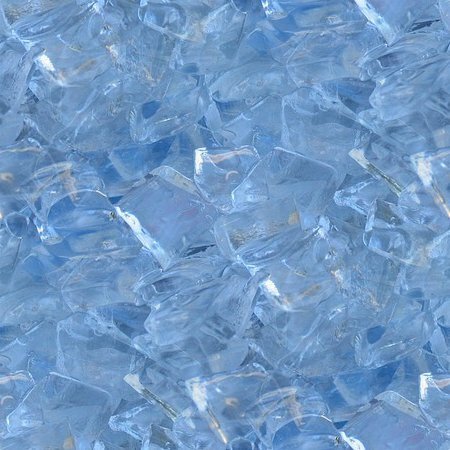 Well, very slight and I was felling my cold in the day time. Different kind every day. Slight fever the other day and now it was, OK, not a sore throat but it could easily develop to something NO GOOD. I'm usually only feeling down for a few hours and then I'm good again, so I hope it is the same this time. But I don't want to take any chances. So a quick walk it was and I was soon inside the arm service centre. 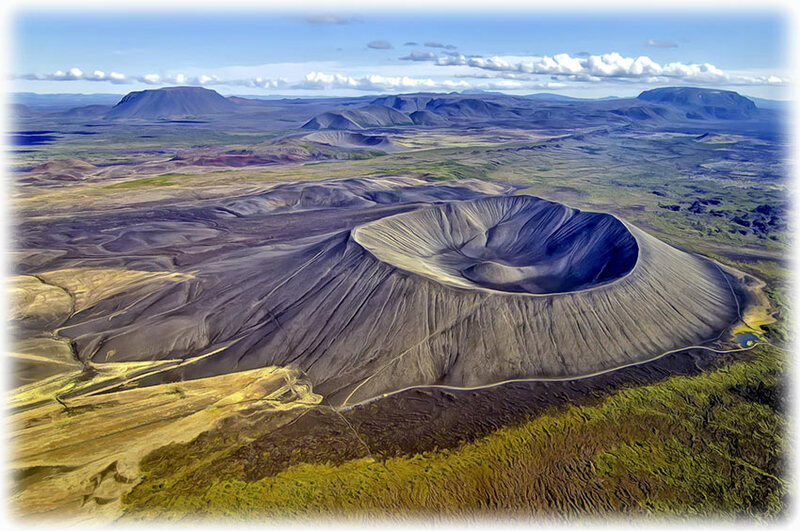 Hverfjall (also known as Hverfell) is a tephra cone or tuff ring volcano in northern Iceland, to the east of Mývatn. 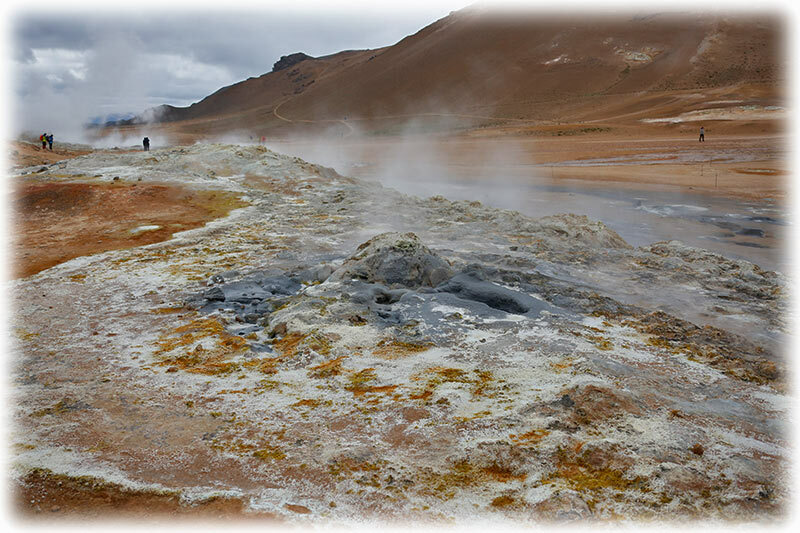 It erupted in 2500 BP in the southern part of the Krafla fissure swarm. The crater is approximately 1 km in diameter. 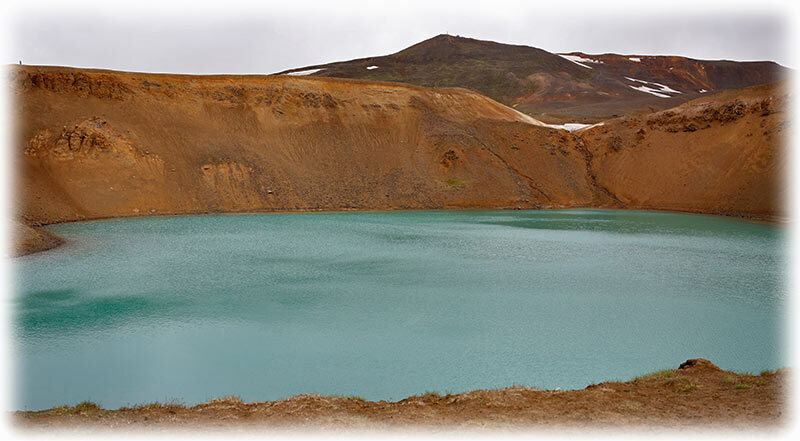 Tephra has been carried from Hverfjall all over the Lake Myvatn area. 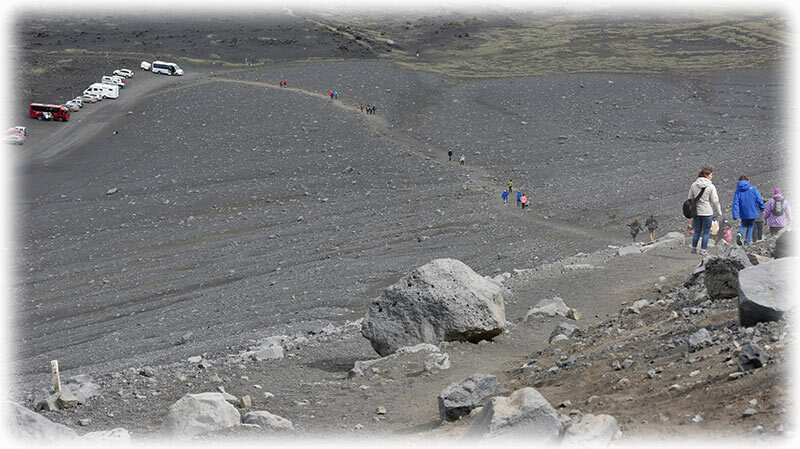 A landslide apparently occurred in the south part of the crater during the eruption, which accounts for the disruption to the round shape of the mountain. 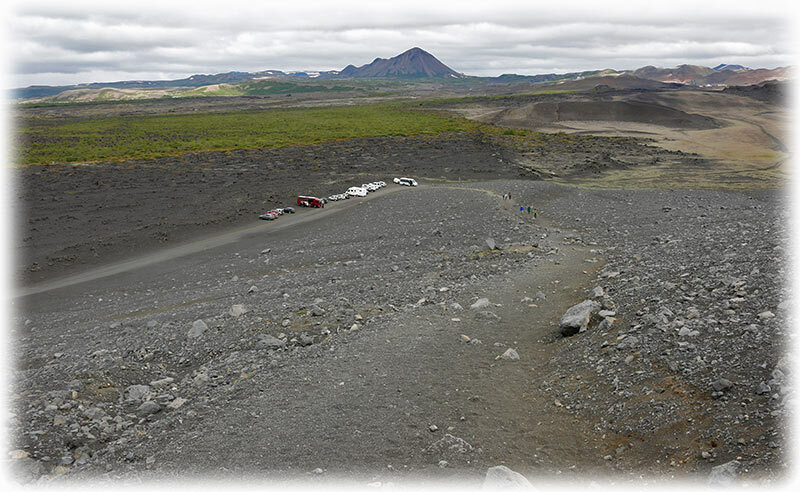 During the Age of Settlement, lava flowed from Svortuborgir, at the southern end of Namafjall, around Hverfjall, which was nearly engulfed by the lava. 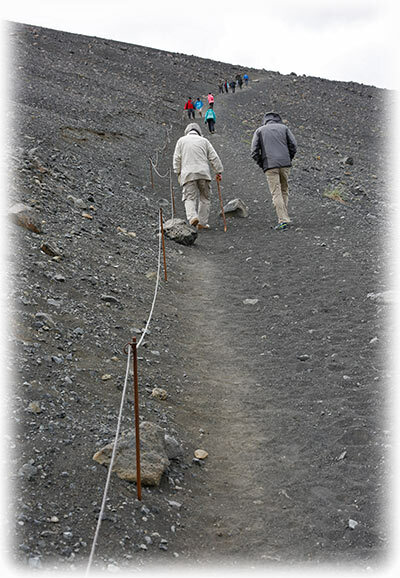 At the same time an eruption occurred in the slopes above the valley of Hlidardalur. 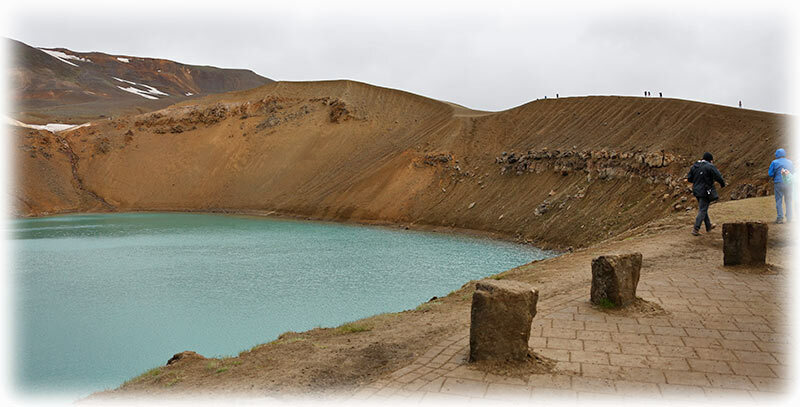 We got out of the car and, well, if I'm on Iceland I will for sure see a crater from the top. 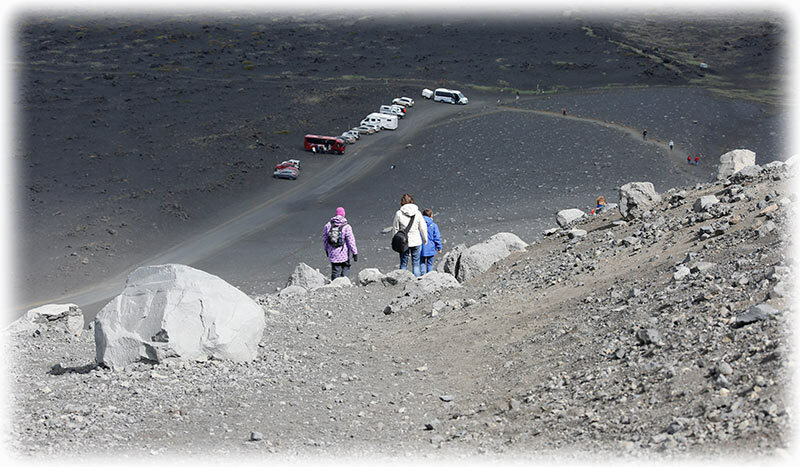 So never mind the climb, it is top of the crater of bust. I was coming in the group with the 3 last passengers and when we approached the top I said that this has to be foocking spectacular. 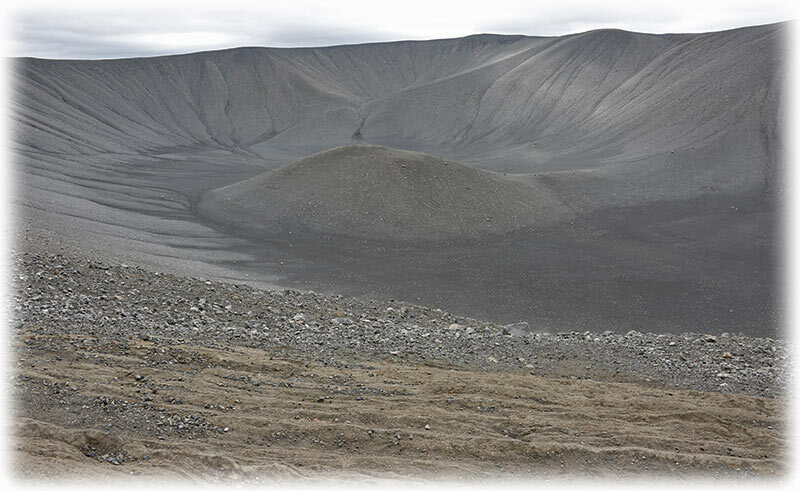 We left Hverfjall and there is another crater to visit. But first we need lunch and we stopped at a farm with a restaurant. - Do you have boiled potatoes? - You have to wait so all can order at the same time. When we were all sitting down we started all over again. When it was my turn to order. I also asked for a pot of Earl Grey tea with some milk. They brought me a cup with hot water and a tea bag. No milk, and I reminded them and when they brought the milk, well, by then the tea was cold. I reminded them again that I had ordered a pot of tea. 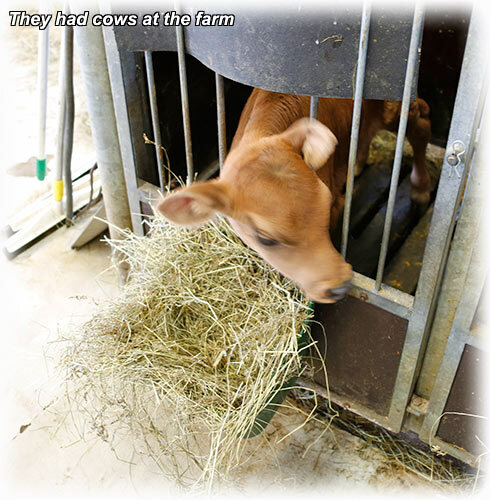 I was slowly losing it and I left the restaurant and I went out to have a look at the cows while waiting for the food. When I was back in the restaurant there was a pot for me. My salmon arrived to the table and I asked for the potatoes. She told me that they didn't had any boiled potatoes, but she could bring me potatoes with melted cheese on the top. There was a roar rising from my throat and for sure, if it had not been for the other passengers I would have exploded. They sell me smoked salmon under the impression (and it is very expensive here on Iceland, salmon and tea was about 50 to 60 US Dollars) and now they offer to give me potatoes with melted cheese WITH SMOKED SALMON. 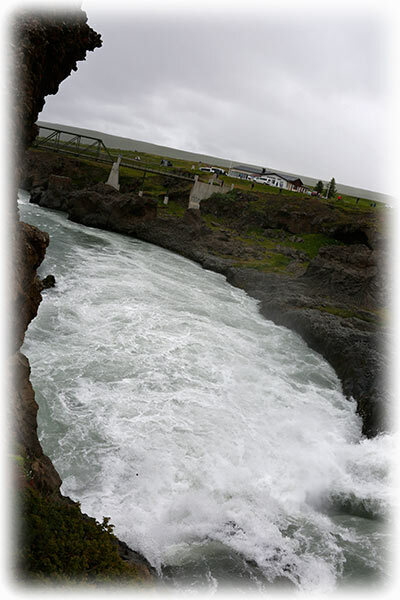 And it had been like this at the most places on Iceland, except at Vogur Country Lodge. They provided us with a 5 star service. Otherwise there is no service minded, just a robbery. A simple meal is close to 100 US dollars. 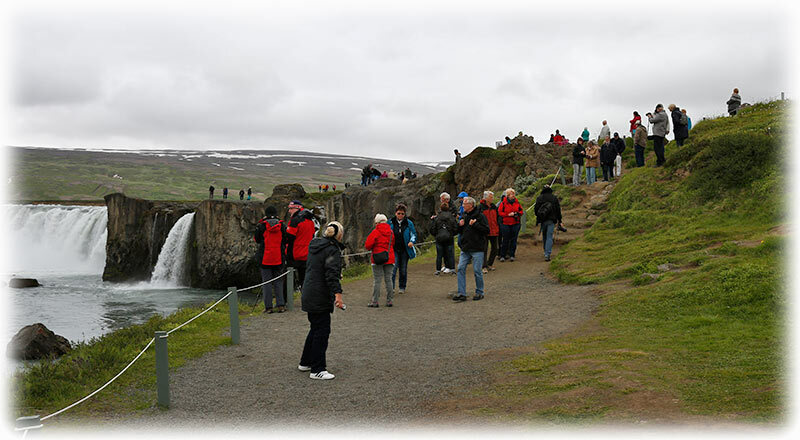 Amazing, they don't understand that the tourist will soon grow tired of this. Password for internet, yes, should be marked in every room and if not, like in restaurants etc. a simple number. But no! ojIJGDrh38e54rGGjgdtROk86 And who the foock can remember that password for more than 2 seconds? And if you do, at a restaurant, 99,999999% are using the internet with their phones, and to key in that password on a small screen. 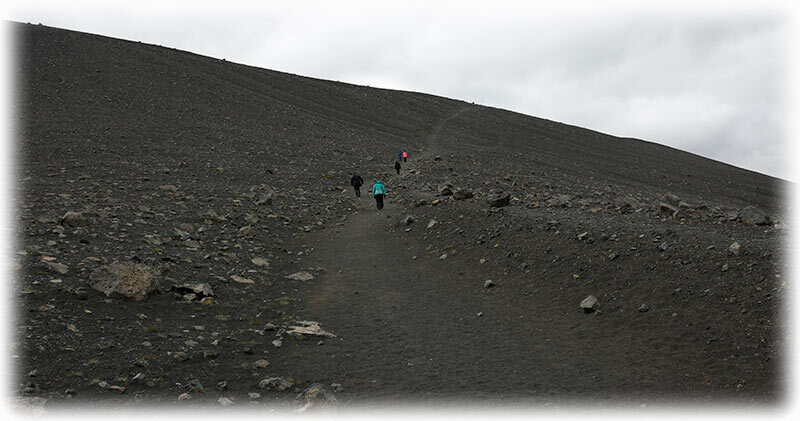 Well, we were soon on the way to a new crater and this on didn't require any climbing, OK, maybe 4 meters. This crater was full of water and I don't remember the name. 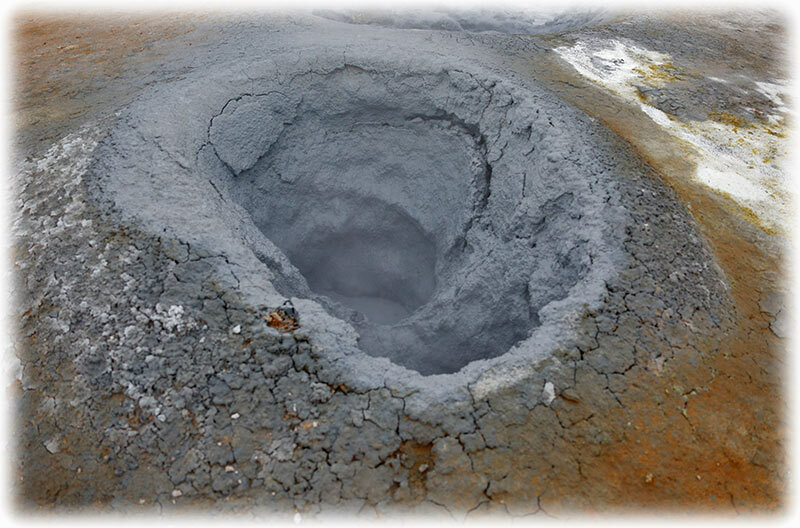 But this crater was full of water. 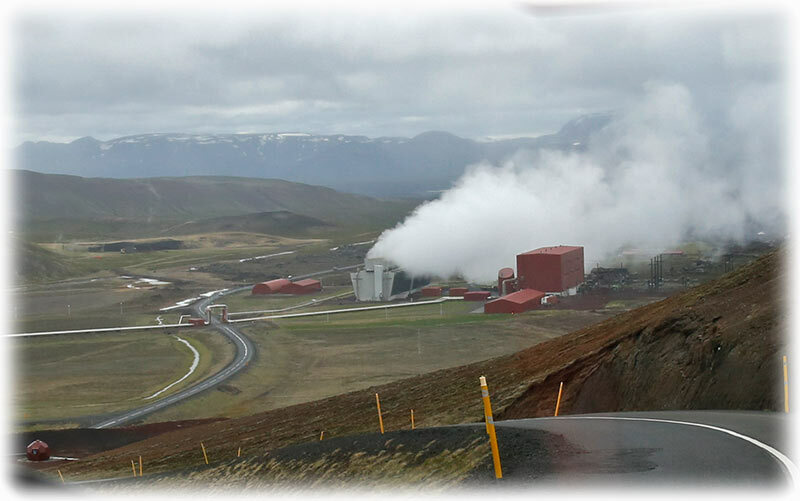 We left the water filled crater and we drove back through the largest or second largest power plant on Iceland. 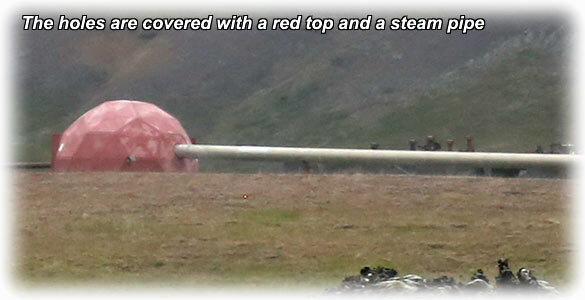 They have drilled holes in the ground and then they just bring up the steam through the pipes. 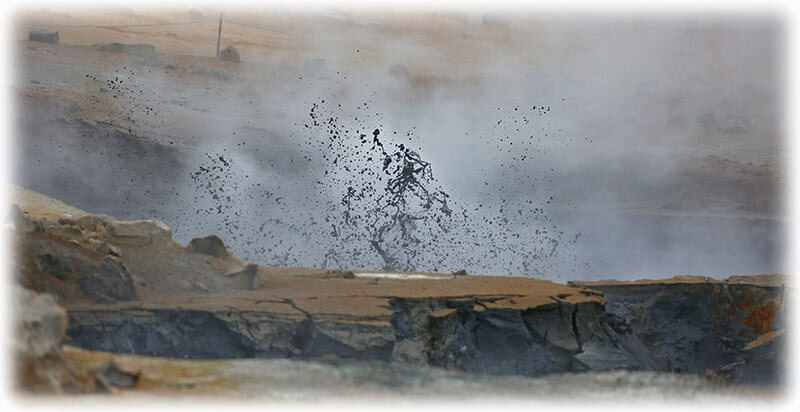 Some of the holes in the area are very close to the volcanos and they have had a volcano eruptions when they drilled holes too close to the volcano. 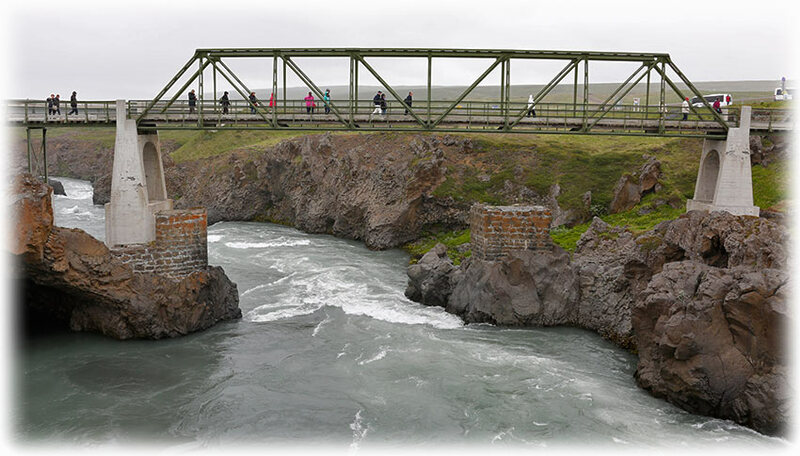 We are in a hot spot and close to the power plant we have an area with boiling mud and this is where we are going now. 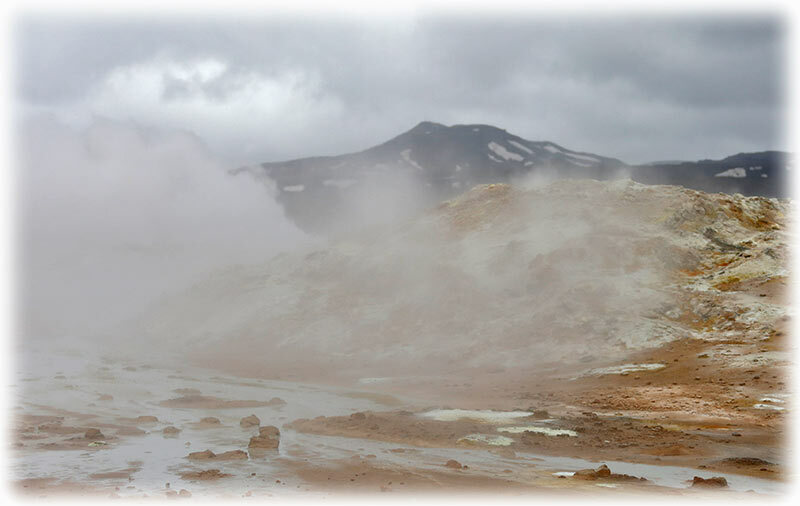 The power plant and the boiling mud area is a few minutes away from the last volcano crater and we can see the steam coming up from the ground when approaching Hverir, a geothermal area with boiling mud pools and steaming fumaroles. Darn! It is really cold and it is not enjoyable to walk around. 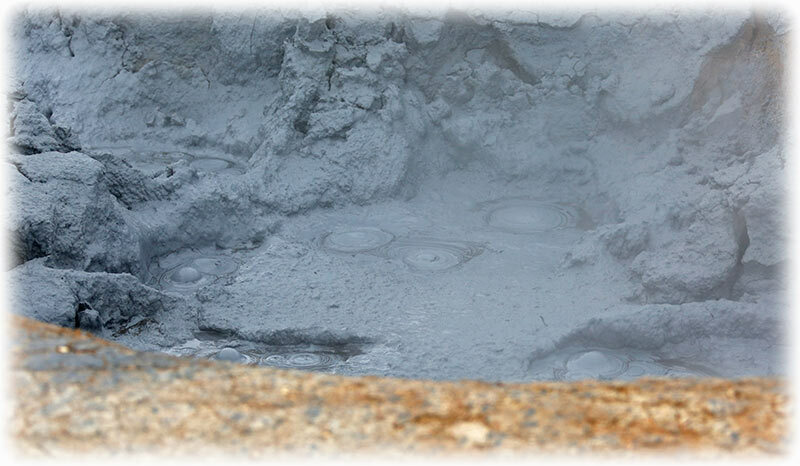 I was walking around the boiling mud very quickly. It would have been nice to spend a little bit more time, but it was too cold. 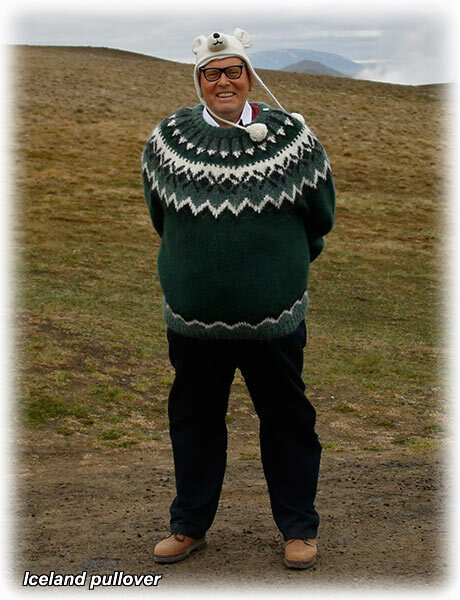 And I really understand why you never see anyone wearing Icelandic pullovers any more. I always used them when I was young. But 200 US and the wind is blowing straight through the darn pullover. Today you can by a warm, wind and water proof jacket much cheaper. But it is a souvenir as well, so no need to buy any more souvenirs. And I have my small Puffin bird from Reykjavik. The hot water area smells like a stink bomb. 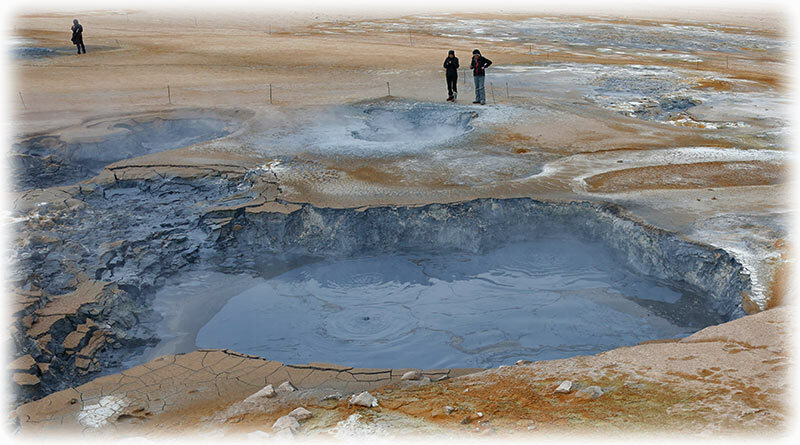 There is some sulphur something in the water and it don't smells very good. But you kind of get used to it. 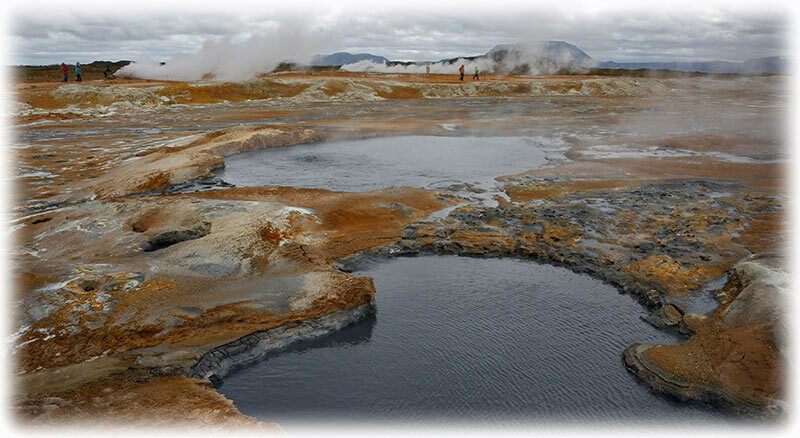 We had passed the hot water area on the way to the crater and we drove back to the hot water after the boiling mud. 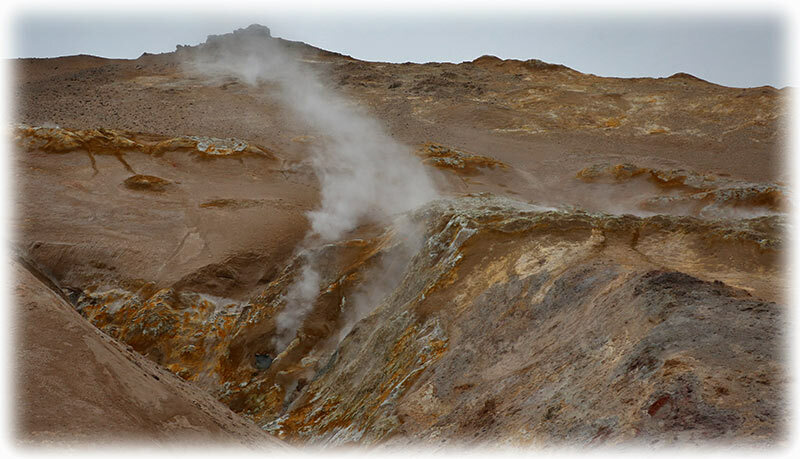 We arrived to a place called Jardbödin and we could smell the sulphur in the air. 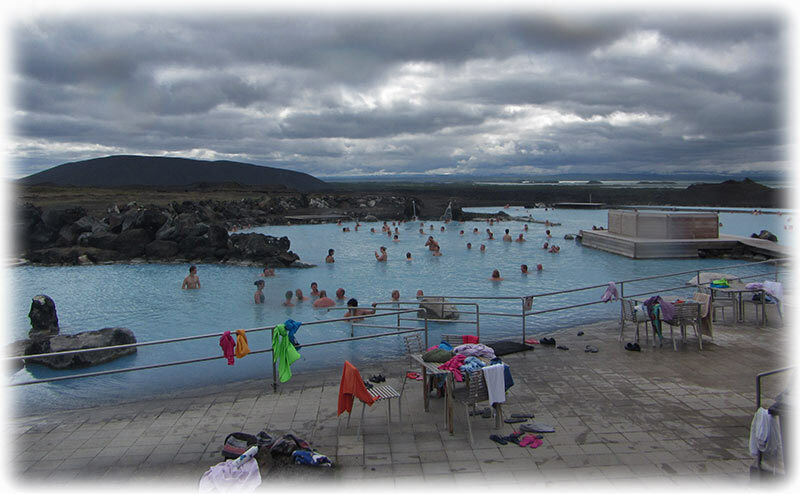 I looked over the fence and there were 2 pools and not as many people as I had expected. And I was happy to discover that. We went inside and we got a towel and a coin for the locker and I was soon in my swimming trunks. I had a shower and I walked 10 meters to the pool, and it was very cold to walk to the pool. 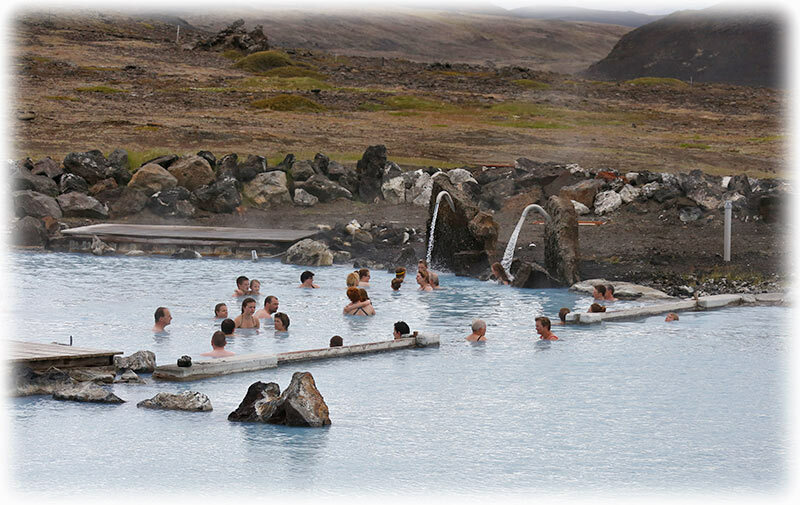 So it is easy to understand that it was very nice to get in to the hot water. I don't know how many degree they kept on the water. I was told that the temperature was about 28°C and it was kind of hot. In Thailand we have around 30°C in the water at the beach. 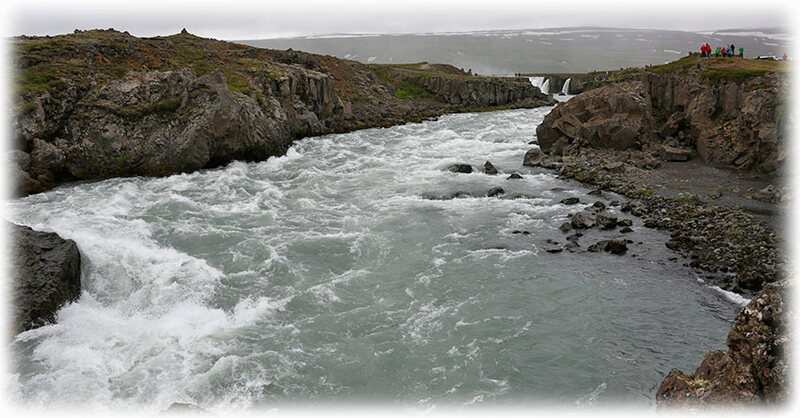 And then the water have a cooling effect. 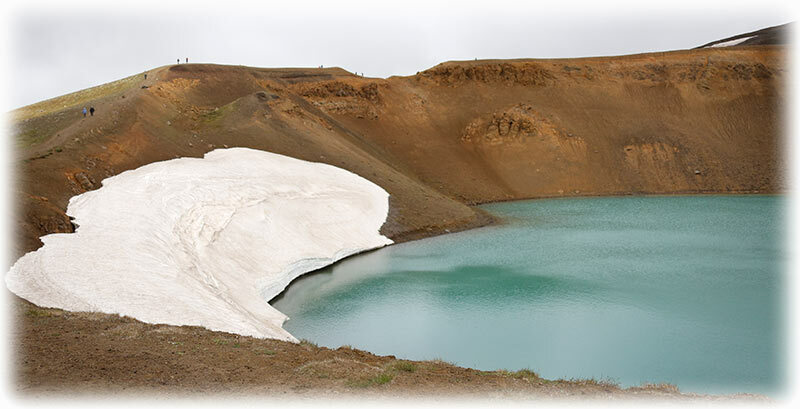 Well, there is about 30°C air temperature difference between Iceland and Thailand. Anyway, it was very nice to get in to the water even though it smelled very bad. 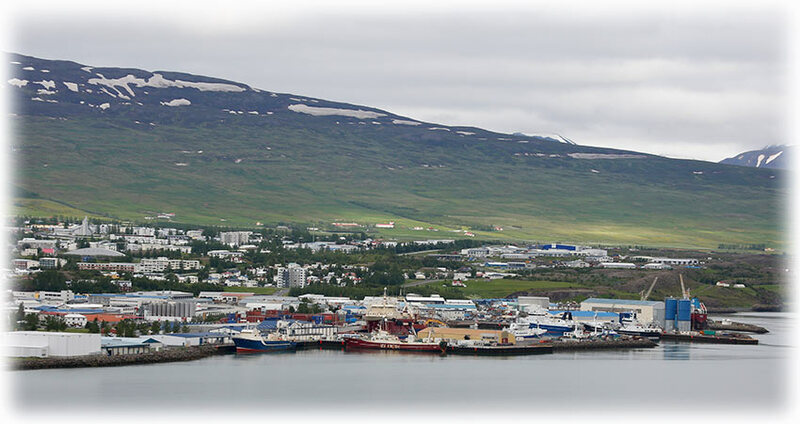 (dimmu "dark", borgir "cities" or "forts", "castles"); pronounced [tɪmʏpɔrcɪr]) is a large area of unusually shaped lava fields east of Mývatn in Iceland. 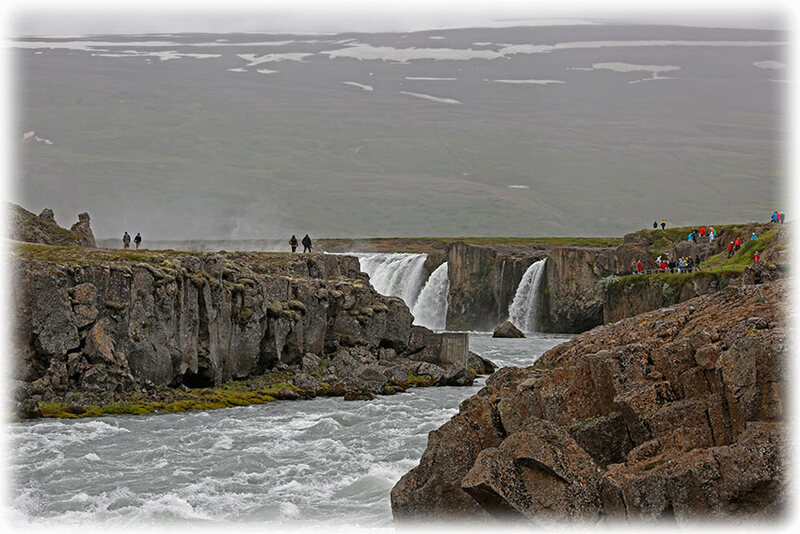 The Dimmuborgir area is composed of various volcanic caves and rock formations, reminiscent of an ancient collapsed citadel (hence the name). 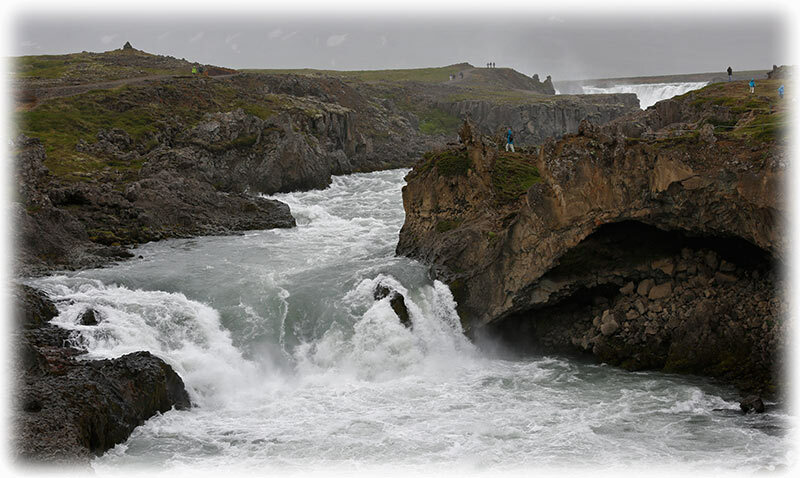 The dramatic structures are one of Iceland's most popular natural tourist attractions. 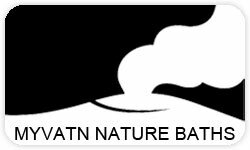 changed my swimming trunks, by now smelling of the sulphur as well. 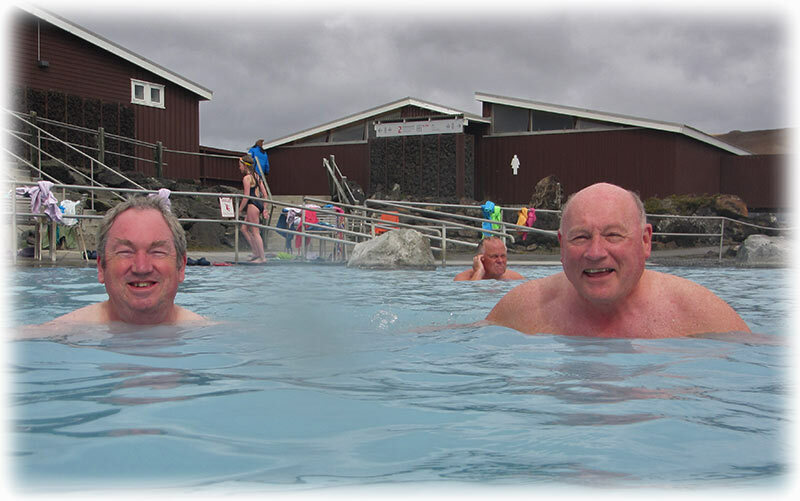 We left the Jardbödin - Mývatn Nature Baths after 90 minutes and we were going for another stop before going to our Hotel. 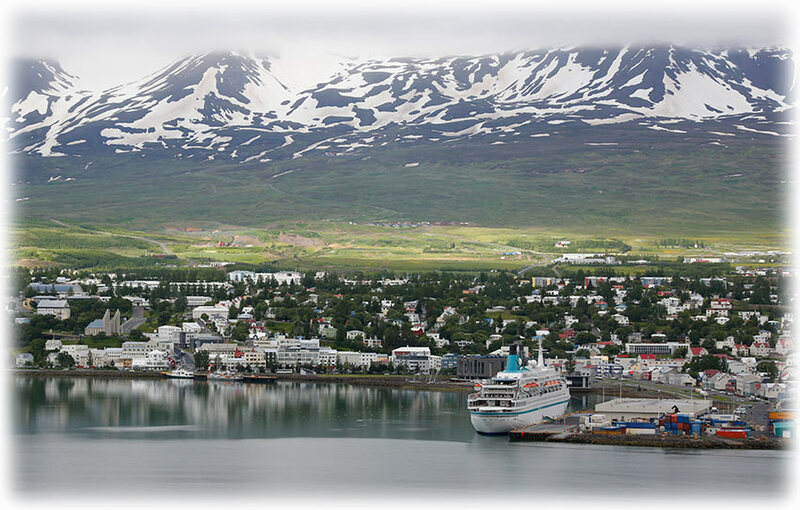 Same hotel change as the hotel we stayed at in Akureyri. 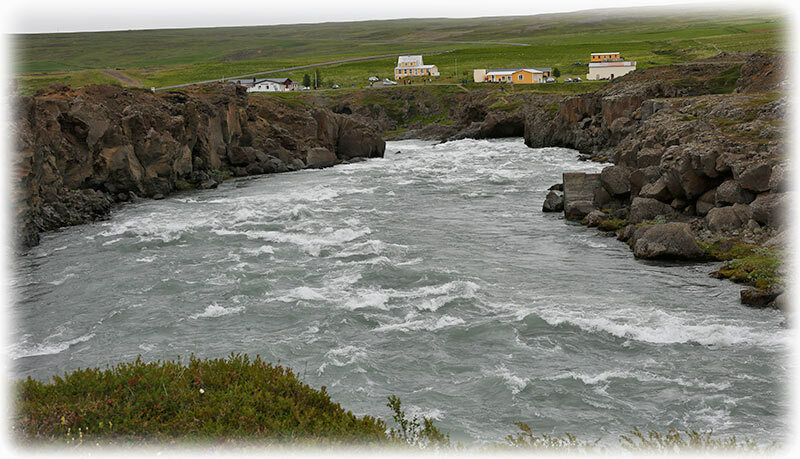 Keahotels, Hotel Gigur in Mývatn. 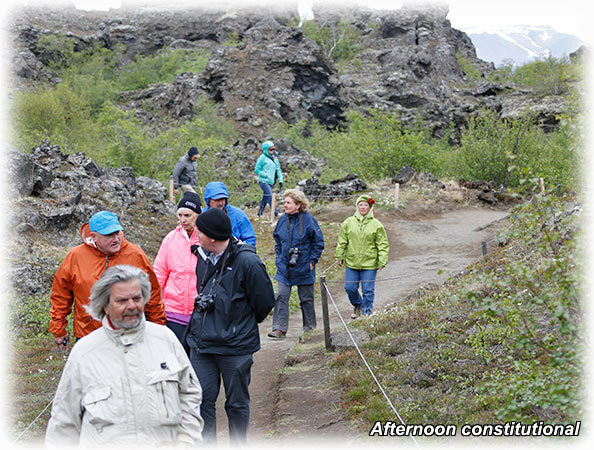 But first we will stop at Dimmuborgir for a constitutional in the area. 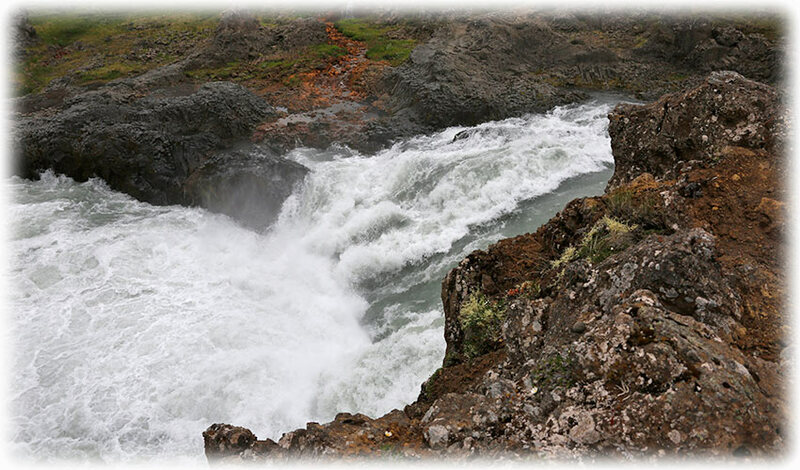 It was a few minutes to Dimmuborgir from the warm water swim. We walked the blue path. Blue means easy and red is the “hard walk”. We chose the blue path and we walked around and it was nice, but I never took any pictures as it never look as good on photo. We were soon back at the mini bus/ van/ airport shuttle and we were discover that one person was missing. Our Guide took off to look for her. A minute or two later her husband took off. - NO NO!!! STAY HERE!!!! But he was off, I don't know what they were hoping for, to find her by chance. The missing girls was soon back and when she heard that her husband was out looking for her she was about to take off to go looking for him. I could not believe me eyes. 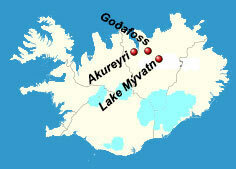 We stopped at a place to look over the Lake Mývatn before we continued to our hotel. We checked in and I was soon to discover the smallest hotel room I have ever seen. I started to rinse my swimming trunks in the sink and I thought that they were really smelling. 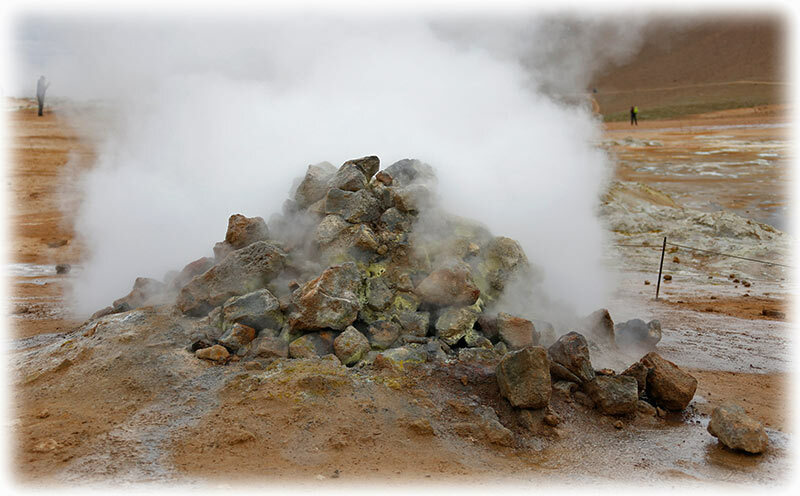 Turned out to be the hot water and I guess the hot water smells like this in the whole area. They didn't had any transformer for my lap top, but they had vanilla sauce and I had a “double” rhubarb pie with a super tanker loaded with vanilla sauce. Seriously, the Waiter had to go back to the kitchen 4 (four) times before I was satisfied. I had transferred my rhubarb pi to a bowl and the bowl was brimmed before I was satisfied. And it was delicious! Wake up call 7 o'clock tomorrow morning and we will leave at 8 bound for new adventures. 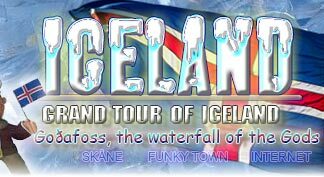 Just click HERE to find out more and it will hopefully be fun.